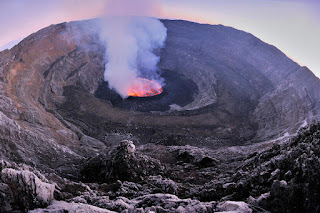 In 2014 Virungas National Park authorities announced that the route to climb Mount Nyiragongo has been re-opened for tourism. Mount Nyiragongo is a spectacular stratovolcano that hosts one of the worlds largest and rarest lava lakes, making it one of Africa’s most exciting and rewarding hiking experiences. Lava lakes are without a doubt one of the most impressive forms of volcanic activity that any outdoors enthusiast could hope to witness. Once you have reached the summit on your Mount Nyiragongo climb, you will be able to observe its bubbling lava cauldron (from a safe distance) and feel this volcano’s energy, as it heaves and breathes. An overnight stay at Mount Nyiragongo’s crater edge will allow you to enjoy this spectacle in the dark, but also at dawn and dusk when its alluring beauty is enhanced. 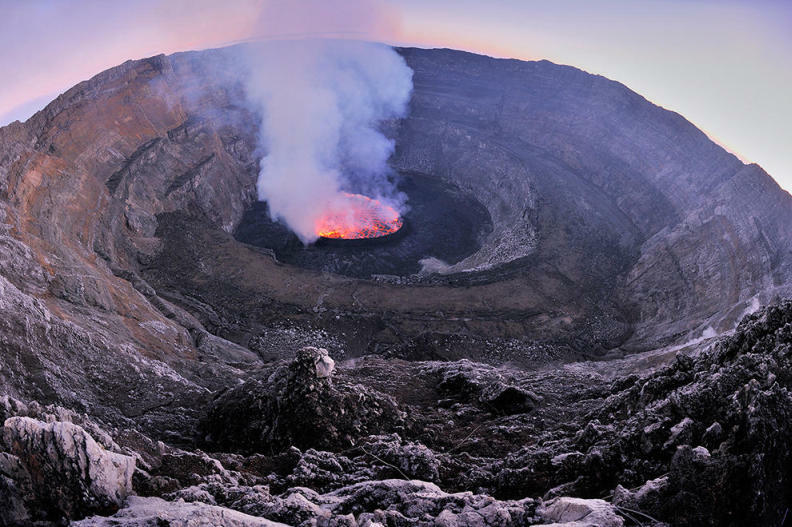 Mount Nyiragongo, in the eastern Democratic Republic of Congo rises majestically to an altitude of 3470m overlooking the Virungas National Park and associated Albertine Rift valley. The climb up Mount Nyiragongo is not technically difficult and reaching the top should not take longer than 5 hours. To further ensure an unforgettable experience this tour includes a mountain gorilla trekking experience in the neighbouring Volcanoes National Park in Rwanda. Coming face to face with mountain gorillas is a hugely primal and humbling experience, if not life-changing. Between these two walking adventures you will also enjoy a short and relaxing visit to the idyllic shores of Lake Kivu. On arrival at Kigali International Airport, met our representative and whisked off to enjoy some of Kigali’s main attractions. Depending on your arrival time the following sites may be incorporated into your visit: The Caplaki Handicrafts Market (the perfect place to browse for Rwandan souvenirs), the Kimironko City Market where all types of colourful and tasty food is sold, or the Gisozi Genocide Memorial & Education Centre, the site that houses over 250 000 victims of the 1994 Rwanda Genocide and stands as a vivid testimony to the courage and reconciliatory efforts of the Rwandan people. After a light lunch in Kigali restaurant you will drive north towards Ruhengeri and on arrival at Volcanoes National Park you will settle in at Hotel Muhabura. Here you will have the chance to freshen up, explore your surroundings and later indulge in a delicious home-cooked dinner at the lodge’s restaurant before your gorilla trekking experience the following day. After breakfast we take a short drive to the Volcanoes National Park headquarters and meet with the local rangers that shall lead your mountain gorilla trekking experience. An informative talk on etiquette required for gorilla trekking will precede the actual walk, Once the gorilla trekking groups/family are formed you will start your climb towards the different territories and areas in the mountains where your allocated mountain gorilla family/group resides. Gorilla trekking can take between 2 and 7 hours and you could climb to altitudes in excess of 2 350m (7 500 feet). Although the climb can be physically demanding the beauty of the forest and surrounding scenery always makes the trekking a worthwhile experience. Once the gorillas are located all fatigue is forgotten. Looking deep into the expressive brown eyes of mountain gorillas is surely the most exciting and poignant wildlife encounter that Uganda, Rwanda, DR Congo and Africa has on offer – and arguably one of the most profound natural history experiences in the world. When the group returns from the hills a transfer will take you to the mellow lakeside town of Gisenyi where you will check into the Paradis Malahide Hotel for a delicious lunch, well-earned shower and rest. No activities have been planned for this afternoon, in order to allow all participants to decide whether they want to rest before tomorrow’s assault on Mount Nyiragongo, or enjoy a leisurely swim in Lake Kivu. After an early wake-up call, breakfast and a swift transfer to the Rwanda/Congo border post, you will cross into the Democratic Republic of Congo and drive on towards the Kibati patrol post at the base of Mount Nyiragongo, a mere 50km outside Goma. After a safety debrief and final check of everyone’s packs and equipment you begin the climb towards Mount Nyiragongo’s summit. The party will be lead and escorted by a set of rangers/guides and a small contingent of porters. For the first two hours of the walk you will traverse a lush pristine forest, where towering trees offer a welcome shelter from the sun until you emerge from the forest onto a small plateau with commanding views that stretch towards the infinite horizon, with Lake Kivu, Bukavu, Rwanda and Burundi at your feet. You are now standing on the lava flow remnants of Mount Nyiragongo’s 2002 eruption. From here on, the climbing trail becomes firmer and the forest gives way to several swathes of recovering heath with vegetation dominated by ferns, sedges, heather and everlastings. Shortly after noon, you will reach Mount Nyiragongo’s crater and your overnight cabins. The remainder of the afternoon will be spent exploring the craters edge and soaking in the surrounding views and Mount Nyiragongos’ bewitching lava cauldron. Fortunately your guides know exactly how to reach the best observation and photogenic spots safely. When everyone has had enough, the party will return to camp to settle into their cabins, rest and enjoy an early supper, At 18h00 you will return to a designated spot at the craters edge to gaze and appreciate again Mount Nyiragongo’s molten lava lake. In the dark of night one is able to appreciate better the dark crusty surface of lava, spliced and splitting into ever changing plates. As the plates separate, bright orange lava fill the cracks and a fantastic spider-web pattern emerges. Every now and then fountains of lava flare up disrupting these pretty patterns, but adding a surge of dynamism and power to this spectacular sight. Sometimes, fountains appear throughout the crust like a collection of campfires, creating yet another fascinating show, As you return to your cabins on Mount Nyiragongo, the lights of Goma glow below, a reminder of what’s in store for the following day. After a rather early cup of tea/coffee, you will be summoned back to the crater’s rim at dawn for one last peek. Wrapped in warm clothing you greet the new day as the intense red and yellow glow of the lava below mixes with a backdrop of blue and indigo skies. After breakfast, the party will commence its descent from to Kibati. The descent generally takes 2-3 hours. Back at Kibati, your transport will be waiting to take you back to Goma for lunch and a short tour of the town before crossing back into Rwanda to check into a Gisenyi hotel, for a well deserved shower, rest and scrumptious farewell dinner. After breakfast, you will be transferred back to Kigali Airport for your home bound flight connection. Accommodation: You will spend one night at Hotel Muhabura: Muhabura Hotel is found opposite the Musanze District headquarters on your way out of town on the main road to Rubavu (Gisenyi). You will be staying in an en-suite room with warm shower, Wifi and satellite TV. Paradis Malahide: This lodge is located 7km outside Gisenyi, at a beautiful location on the shores of Lake Kivu, with lovely views across to the islands. The bungalows and the main dining/reception areas are surrounded by well-manicured and colourful gardens. A small section of public and private beaches allow visitors to fully enjoy Lake Kivu. All en-suite bungalows are cool and comfortable with a double bed, mosquito netting, bamboo chairs and a small table, as well as a wardrobe. It is a perfectly integrated, charmingly rustic, simple lodge that is enthusiastically run, and offers great food. Mount Nyiragongo Cabins: These cabins are relatively new (2011), built on the edge of the volcanoe’s crater, wooden, en-suite, spacious and endowed with two beds each. They are rustic, practical and comfortable. Fitness: A basic level of fitness is required for trekking mountain gorillas in Volcanoes National Park. Climbing Mount Nyiragongo in Virungas National Park requires a reasonable-good level of fitness and basic hiking experience. Summiting Mount Nyiragongo involves a 4-6 hour uphill climb often on uneven volcanic rock, muddy tracks and slippery trails. It is however not particularly steep. The pace of both trekking experiences will be set and determined by professional trekking guides who always ensure that everyone reaches the targeted troop/camp. To make your experience even more enjoyable, porters that can carry your bag (max.15kg), will be available for hire at Volcanoes National Park (Rwanda) and have been pre-arranged at the Kibati Patrol Post in Virungas National Park DR Congo. Security: Many of the structures required to run Africa’s oldest national park have been restored by the tireless efforts of hard working rangers and staff of the Virungas National Park. These included the cabins and shelters at the craters’ rim – a heroic feat when one considers that every single piece of building material had to be lugged on foot to an altitude of 3,400 m. The work done by the people involved in rebuilding and protecting the parks assets, as well as those that to date ensure a safe passage and stay at this national park, is nothing short of heroic and well worth rewarding with one’s presence! Included: Transfers to and from the airport in Kigali on arrival and departure days. Transport in a 4WD vehicle for the entirety of this tour, including fuel. Services of an English speaking tour guide /driver. Four night’s accommodation on full board. All meals mentioned in the itinerary. A single entry gorilla permit per person and required entrance fees for Volcanoes National Park and Virungas National Park in DRCongo. The services of a Mount Nyiragongo guide, and one porter per person climbing Mount Nyiragongo. Sleeping bag for Mount Nyiragongo’s hike and hot meals/drinks. 24/7 office support. Excludes: International or local airfare (however we can help you with booking your tickets). Rwandan Visa, DR Congo and airport departure taxes. Internet services, items of personal nature, telephone calls, laundry, travel and medical insurance, tips, excess baggage charges, gratuities to lodge staff, drivers and the leader. Any activities not specified in the itinerary.